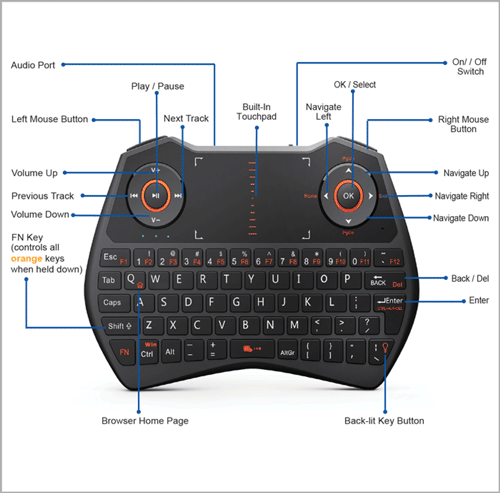 The SlimTouch 4020 - 2.4GHz Wireless Keyboard with Touchpad is the perfect tool for your Computer, Smart TV, Android TV Box, Projector and gaming consoles. Take control of it all in the palm of your hand with the Adesso WKB-4020UB Wireless Keyboard with Touchpad! Whether on your PC or at home on your Smart TV, you can be a comfortable distance away & still access shortcuts, even browse the internet, search for your favorite videos or songs with the built in touchpad. With the Adesso 2.4GHz Wireless Keyboard with Touchpad you can sit, relax, and enjoy entertainment the way it was meant to be! 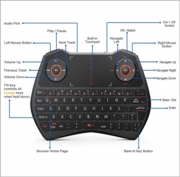 This is the perfect device for navigating or typing on your Computer, Smart TV, Android TV Box, Projector ,Playstation and Xbox gaming consoles.